From south to north, the islands of the Atlantic covered here include the Scotia Arc (South Shetland, South Orkney, South Sandwich, and South Georgia), Bouvet, the Falklands, Tristan da Cunha and Gough, St. Helena and Ascension, Macronesia (Cape Verde, Canaries, Madiera, and Azores), Bermuda, Sable, Faeroes, and Jan Mayen (Fig. 1). The Caribbean islands, Iceland, Great Britain, and Ireland are covered elsewhere. With only a few exceptions such as Bermuda and Sable, it is clear from the spatial distribution of almost all of the other individual islands or island groups in the Atlantic Ocean that most owe both their location and coastal morphology to a turbulent tectonic and often volcanic past. The tectonic opening of the Atlantic Ocean is the key factor in this history. 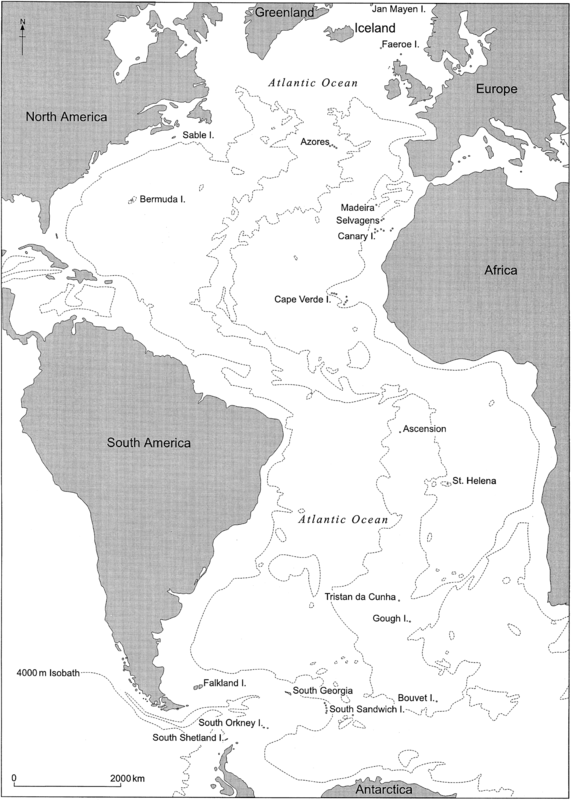 Commencing in the Late Jurassic some 140 million years ago and fully open some 65 million years ago (Hansom and Gordon 1998), the Atlantic basin is characterized by the westward movement of both American plates and the eastward movement of the African and Eurasian plates. Basaltic magma upwelling into the crustal gap in the mid-ocean spreading center has over time produced a long submarine ridge composed of a series of fissure volcanoes known as the mid-Atlantic Ridge. In places the volume of upwelling magma has been sufficient to allow the construction of volcanoes that extend to the ocean surface and form the individual volcanic islands and island groups of Bouvet, Gough, Tristan da Cunha, St. Helena, Ascension, Macronesia, Kelard, and Jan Mayen. Elsewhere, where more than two plates and spreading directions are involved, this relatively simple mid-Atlantic geometry is more complex. For example, the development of the Scotia Arc in the South Atlantic was contingent on the opening of the Drake Passage and the eastward movement of several micro-plates along a progressively elongating arc. The boundaries of the Scotia Arc are marked in the south by the South Shetland and South Orkney Islands, in the north by South Georgia and in the east by the still-extending volcanic island arc of the South Sandwich Islands (Hansom and Gordon 1998). As a result, the rocks of South Georgia, South Shetlands, and South Orkney are mainly composed of fragments of older rocks and intruded volcanics, most of which were created elsewhere and subsequently transported to their present sites. By contrast, 70% of the rocks of the South Sandwich Islands are recently extruded basalts (Baker 1990). This tectonic and volcanic past has also ensured that, with exception of parts of the Scotia Arc in the South Atlantic and Bermuda and Sable Island in the North Atlantic, almost all of the remaining mid-ocean islands are of volcanic origin (Bird 1985a, b). Many remain as active volcanoes that rise from deep water and their coastlines are mainly characterized by steep cliffs cut into lava, ash or hyaloclastite. Since many of the volcanoes themselves are youthful, the coastlines are also young and in a state of continuing adjustment in response to marine activity and ongoing volcanic events. For example, Fogo, in the Cape Verdes, is an active stratovolcano with a symmetrical cone rising out of the ocean (Fig. 2). Its slopes are composed mainly of subaerial lava flows, some of which are dated, and all of which end in marine cliffs, sometimes with small cliff-foot beaches composed of basalt boulders and gravels. Like most Antarctic coasts, the coasts of the Scotia Arc islands are mainly cliffed and rocky. Many of the cliffs are cut in glacier ice and beaches are regionally rare (Hansom and Gordon 1998). Rapid cliff retreat rates of 1 cm a−1 have been calculated for the cliffs of Fildes Peninsula in the South Shetland Islands and are thought to be the result of efficient frost shattering (Hansom 1983a). Since all of these coasts are affected by sea ice for up to eight months of the year, the more normal coastal processes associated with wave and tide operate intermittently and often in conjunction with floating ice fragments (Hansom and Kirk 1989). This means that the relative order associated with wave processes is annually swept away and replaced by the bulldozing and grinding action of floating ice so that beach sediment is moved in a nonselective way to produce disorganized fabrics and landforms. In the South Shetland Islands much of the coast is either rock or ice-cliff, although some glacier termini rest on a low rocky platform at sea level. There are important exceptions, however, and significant beach development occurs on the peninsulas that protrude beyond the ice cover. The Fildes and Byers Peninsulas on King George Island and Livingston Island, respectively, are adorned with extensive emerged beach deposits, some of which connect offshore islets and skerries to the shore platforms of the main island (Fig. 3). Prominent shore platforms occur at sea level and at altitudes of 3–8 m, 11–17 m, 28–50 m and 85–100 m above sea level and are cut into a variety of rock types (Hansom 1983a). Although gravel beaches are found up to 200 m above sea level the most extensive are sited on the lower shore platforms at altitudes of 2.5–3 m, 5.50–6 m, 8–10.5 m, 12–13.5 m, and 16.5–18.5 m above sea level, as well as at present sea level (John and Sugden 1971; Hansom 1983a). Since the extensive sub-horizontal shore platforms that occur at present sea level in sheltered locations give way to steeper, ramp-like platforms in more exposed locations, Hansom (1983a) related their development to the interplay between the frequency of floating ice blocks that horizontally abrade the surface and wave activity that produces ramps. 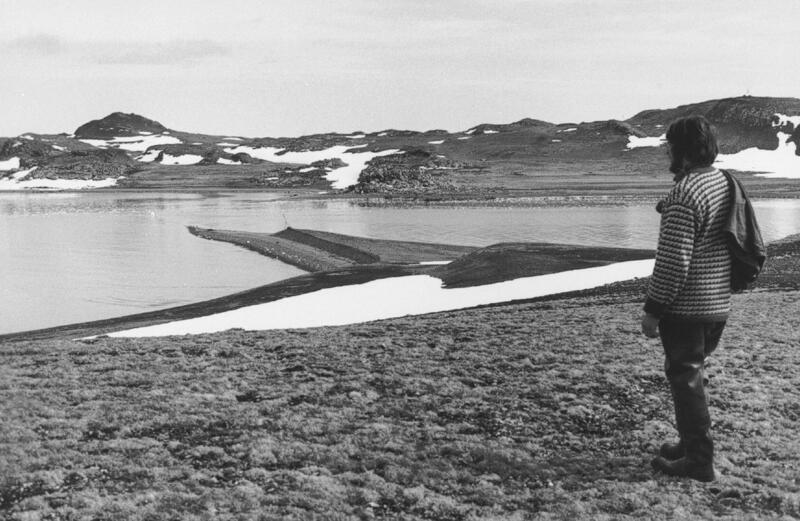 The upper part of the sub-horizontal platforms within sheltered bays is often adorned with an undulating layer of boulders that have been smoothed and compacted into extensive boulder pavements by the action of floating ice blocks (see Boulder Pavement) (Hansom 1983b). Three of the islands, Penguin, Bridgeman, and Deception, are relatively new and active volcanoes and erosion of the friable rocks of the outer coast has produced cliffs of a variety of heights. The inner crater of Deception Island has been inundated by the sea and has several sand and gravel beaches that are frequented by penguins and tourists alike, in sharp contrast to the steep rocky outer coast. Whereas the extensive beaches of parts of the South Shetland Islands allow for easy landing for both wildlife and boats, the coastline of the South Orkney Islands is more formidable. Three of the four largest islands, Coronation, Powell, and Laurie are dominated by large permanent ice caps spilling down steep rocky cliffs which plunge below sea level. A few bouldery beaches occur, for example, on Laurie Island. The remaining island, Signy is characterized by ancient schists and amphibolites that have been glacially scoured to produce a relatively low and rolling coastal plain with a rocky sloping shore albeit with only a few bouldery beaches. The coast of the South Sandwich Islands is as inhospitable as that of South Orkney, since only a small proportion of land is free of ice and there are few beaches or easy landing points. The South Sandwich group consists of a 400-km-long volcanic island arc caused by the subduction of the South Sandwich plate beneath the South American plate. Rising from an 8,428 m-deep ocean trench, the eleven main islands are all volcanoes made up of 60% lava and 40% tephra (Baker 1990). The coastline is steep and cliffed but because many of the islands are still active volcanoes, erosion of softer tephras has produced a crenulate coastline with infrequent small bouldery beaches. All of the islands except Zavodovski are characterized by reefs and skerries and these are especially well-developed between smaller island clusters, such as in the extreme south at Thule, Cook and Bellingshausen islands. Low altitude bare coastal plains do occur on some islands, such as Zavodovski and Bellingshausen, but few scientists have investigated these islands and so, the nature of the plains is unknown. In the strong westerly ocean circulation of the Scotia Sea, pumice from South Sandwich is known to travel great distances. The pumice from a submarine eruption close to Zavodovski Island in March 1962 reached the beaches of New Zealand in late 1963, having been transported east within the Antarctic Circumpolar Current at 11–17 cm s−1 (Hansom and Gordon 1998). Ardley Island, in the South Shetland Islands, is connected to one of the main islands by an intertidal sand tombolo and is adorned with raised beaches whose altitudes are the same as those on the adjacent islands. South Georgia on the northern limb of the Scotia Arc, is a 170-km-long and 40-km-wide sequence of volcaniclastic sediments folded into a mountain range that rises out of the Atlantic Ocean to heights of over 2,700 m. It is not volcanically active but is heavily glacierized and has all the characteristics of a glacially eroded coastal fold mountain range. Long ridge-like peninsulas separated by deep glacial troughs jut out into the sea. The south coast is more heavily glacierized than the north and is extremely rocky and dominated by steep cliffs cut in ice or rock. The few small cliff-foot gravel or sandy beaches that occur are swept by storm waves from the southwest and occasionally by storm surges (Hansom 1981). On the north-facing coast, the glacier cover is more restricted and a significant amount of ice-free ground exists, particularly on the peninsulas. The peninsulas are flanked by high and steep cliffs but these often have narrow shore platforms at their base together with numerous offshore islets and skerries. Some fragments of emerged shore platforms are known to occur at altitudes of 2, 5, 6–7, and 20–50 m above sea level but a systematic study of distribution and altitude is lacking (Clapperton 1971). The lower of the shore platforms are often adorned with emerged beaches at 2–4 m and 6–7.5 m above sea level (Clapperton et al. 1978). Within the northern bays and fjords of South Georgia lie the most extensive beaches of the Antarctic region. Fed by numerous debris-laden glaciers and short glacifluvial streams, substantial areas of the sheltered inner fjord heads have become infilled by glacifluvial outwash plains fringed by extensive sand and gravel beaches (Hansom and Kirk 1989). The largest of these outwash beaches occur at Salisbury Plain, Fortuna Bay, Cumberland Bay and St. Andrews Bay (Fig. 4) (Gordon and Hansom 1986). Some of the inner reaches of the fjords of South Georgia are affected by sufficiently large quantities of floating ice calved from adjacent glaciers to allow the development of intertidal boulder pavements similar to those produced by sea ice further south (Hansom 1983b). The coastline of the Falkland Islands, like the islands themselves, is low, flat, and reminiscent of the coastline of the Outer Hebrides of Scotland. Although hundreds of smaller islands exist, the main island group comprises West and East Falkland separated by Falkland Sound. The intricate and crenulate nature of the coastline is probably more related to the submergence and faulting of the underlying Devonian, Carboniferous, and Permian limestones and sandstones, rather than to the efficiency or otherwise of marine erosion and deposition. In spite of the majority of the coastline being rocky, steep and high cliffs are mainly absent except in the extreme west where 100–200 m cliffs occur at Beaver Island. Everywhere and especially within the broad embayments and inlets, there are innumerable small islets and skerries whose detailed morphology and outline appear to be structurally controlled. A notable feature of the rocky coastline is the abundance of dense stands of giant kelp in the nearshore. On the western flank of the fault that controls Falkland Sound, narrow coast-parallel outcrops of hard and softer rock have been eroded to produce an intricate series of small headlands composed of more resistant rock separated by small arcuate bays cut into less resistant beds. The result is an essentially linear coastline stretching the entire length of Falkland Sound, broken by regular and uniform bays where the outer rocks have been breached. The crenulate nature of the coastline and extensive areas of nearshore shallow water means that a wide range of sheltered locations exists for potential beach development. Streams, although abundant and rarely dry, do not appear to contribute significantly to beaches, since there is a lack of beach development adjacent to the mouths of the creeks and streams entering tidal waters. Beaches of sand and gravels tend to be located in either outer coast sites where ocean waves gain access or within inlets where more open aspects allow wind-generated local waves to produce beaches. The high proportion of shell-sand of the beaches points to an important biological input from nearshore shallow waters. Significant beach development on the outer coast occurs at Bull Point, Lively Island, and at Bertha’s Beach where sandy spits and tombolos connect small islets to mainland East Falkland. Paloma Beach, Elephant Beach, and Concordia Beach in the north of East Falkland are all examples of large open coast sandy beaches where strong winds have resulted in blown sand spreads over inland areas. In West Falkland, large beaches occur within the inlet of Whitsand Bay. Unfortunately, as a result of indiscriminate mine-laying during the Falklands War, several of the beaches of East Falkland are now unsafe and access is restricted. Bouvet Island (Fig. 1) stands at the southern end of the mid-Atlantic Ridge, the slopes of the central cone terminating on all sides in precipitous cliffs that descend abruptly to sea level. Probably a complex of volcanic cones, the island rises almost symmetrically to a flat ice-covered dome 935 m high. The ice covers the eastern side of the island where it reaches the sea in an ice cliff 122 m high. The north and west sides are free of ice but are much steeper. 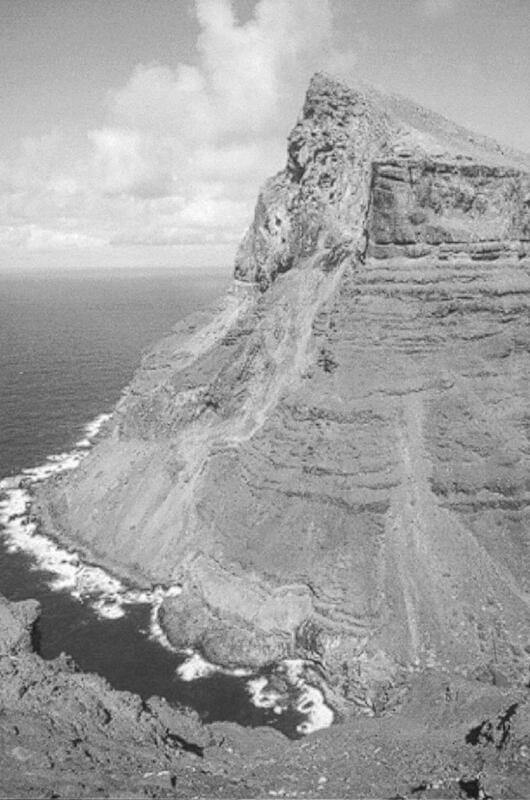 Between 1955 and 1958, a new 0.2 km2 rock platform emerged at 25 m above sea level as a result of either eruption or rock falls associated with tremors (Stonehouse 1972). Since little low-level ground was previously to be found around the coast of Bouvet, the new addition has become a prime-breeding site for penguins, petrels, and seals. Gough Island (Fig. 1) lies 2,300 km to the east of the Cape of Good Hope, South Africa and is the eroded summit of a Tertiary volcano. Although the island is mountainous, rising to 910 m above sea level, the slopes are cut by deep gullies or gulches and the coastline is characterized by steep cliffs that appear to have undergone erosion to produce a variety of narrow boulder beaches at the foot of the cliffs. There are also numerous islets, stacks, and skerries that mostly lie within 100 m of the coast. Tristan da Cunha lies 350 km to the northwest of Gough. It is a circular island of 98 km2 with four other small islands close by. The base of the central volcanic peak lies 3,700 m deep on the seabed and the summit rises to almost 2,100 m above sea level. The lower slopes are almost entirely lava and form high cliffs that surround the island. Emerged beaches, platforms, and caves occur at 5 m above sea level on Tristan but 12 m above sea level on the small adjacent islands, indicating differential tectonic uplift in the area (Bird 1985b). In some places, small and inaccessible beaches occur, some of which are sandy. A small plateau at the foot of the main cliffs on the northwest side at Herald Point provides the site for Edinburgh, the only inhabited part of the island. The cliffs are lower along the Edinburgh coast, allowing access to the sea via small gullies. A narrow gravel beach has developed along this stretch of coast, fed by material eroded from the cliffs. 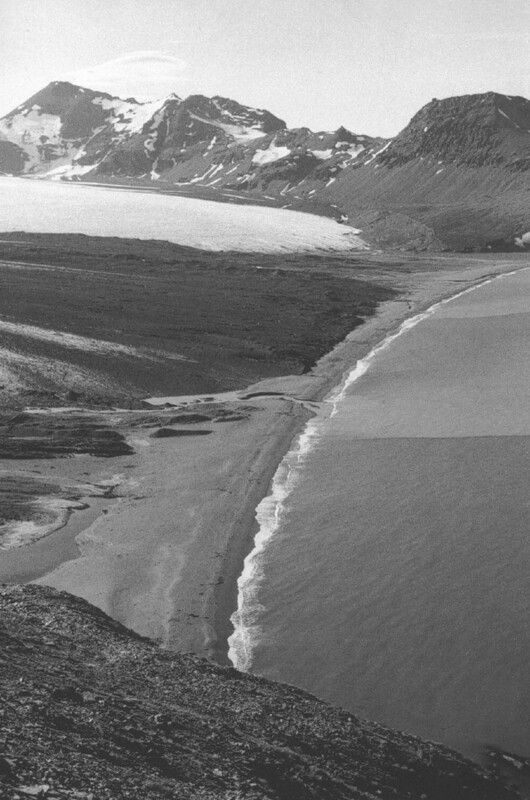 In the months following the 1961 eruption at Big Point, on the updrift section of this coast, rapid recession of the cliff was noted (10 m in 8 weeks). This contributed to accretion of the downdrift gravel beaches which formed a spit enclosing a small lagoon (Bird 1985b). St. Helena (Fig. 1) is 122 km2 in area and lies in mid-ocean, 2,900 km from Brazil and 1,900 km from the west coast of Africa. Like Tristan and Gough, the coastline comprises high stepped and sometimes vertical cliffs cut by steep v-sided valleys. Emerged shore platforms stand at 4–6 m above sea level (Bird 1985b) and the numerous offshore islets and skerries common on the south and west coast, such as at Egg Island and Cockburn Battery, are almost absent from the north and east coast. The highest cliffs occur at Flagstaff Bay in the north and at Man and Horse Cliffs in the southwest where they reach 580 m. The vertical steps in the coastal cliffs often correspond to differences in the composition of the outcropping of lava flows. At Great Stone Top, Turks Cap, and Prosperous Bay on the east coast, thick flows of trachyte form vertical faces, which cascade debris onto stone chutes below (Fig. 5). Some of these extend into the sea to form fringing boulder beaches but nowhere on the outer coast are these well developed or extensive. Only in favored locations where the deep gulches reach the coast do small beaches, some of sand, occur, such as at Lemon Valley Bay. At Sandy Cove on the south coast, the sandy beach is backed by calcareous sand dunes. In mid-ocean some 1,300 km north of St. Helena lies Ascension Island, a Holocene stratovolcano with no known historic eruptions (Simkin and Siebert 1994). Although more arid than St. Helena, the coasts of both islands are similarly high and surrounded by steep cliffs cut into volcanic lava. At Boatswain Bird islet, a natural arch has been eroded into a 98 m high monolithic stack of trachyte (Bird 1985b). However, Ascension also has superb white sand beaches derived from shell and coral. Outside of the Caribbean area, the Atlantic Ocean is not noted for its corals although small structures are known from the coast of western Africa (Trenhaile 1997). Although little seems to be known of the nature of the sediment supply to the Ascension beaches, the carbonates can only come from shells and coralline algae (such as Lithothamnion) growing in the narrow shallow water fringing the island. Erosion of adjacent rock shores and terrestrial sediment in-washed by infrequent rains probably account for the remainder of the beach sediment. The island groups comprising Macronesia stretch lie in a long line that extends north between the coast of West Africa and the Portuguese coast (Fig. 1). All of the island groups are volcanic in origin and many remain active volcanoes. Four main stratovolcanoes occur in the arid Cape Verde Islands, Fogo, Brava, Santo Antao, and San Vicente. Fogo is 2,829 m high yet only 24 km wide and so the steep seaward slopes end abruptly in retreating cliffs. The volcano has erupted 10 times between 1500 and 1995 each one sending long streams of lava down the flanks into the ocean and altering the coastal geometry. A similar picture characterizes the other islands of the group, each being surrounded by steep cliffs cut by deep gullies at the foot of which occur infrequent gravelly beaches. Emerged features have been noted at six levels up to 100 m above sea level. Some bays contain fringing algal reefs and in some locations boulders have been moved inland by wave activity by up to 200 m (Bird 1985b). The Canary Islands comprise seven main islands, six of which host volcanoes. Some of these have erupted as recently as 1971. The coastline of the Canaries resembles that of the other mid-ocean volcanic islands in as much as the central volcanic spine of the islands falls steeply to a mainly rocky and cliff coast cut by deeply incised ravines. For example, in the northwest of Tenerife at Acantilado de Los Gigantes, sub-vertical cliffs reach 500 m. The occurrence of such cliffs has constrained some of the tourist-related expansion that many of the coastal towns and villages have undergone in recent years. Some cliffs have been formed in sediments brought down by torrents in the ravines. These deposits have since been tectonically uplifted together with the boulder beaches that once fronted them. The north coast of Gran Canaria has good examples of such cliffs, together with well-developed shore platforms a few meters above sea level. However, the volcanism of the Canaries has in places produced several long and low craggy volcanic peninsulas that have allowed beach development to occur. Fuertoventura, Lanzarote, Tenerife, and Gran Canaria all have sandy beaches some with extensive sand dunes. The long white sand beach at San Andres, on the southeast coast of Tenerife, has been artificially nourished with sand brought from the Sahara Desert. Between Maspalomas and Playa del Ingles, in the south of Gran Canaria, 328 ha of fine shell sand have accumulated at the mouth of the Fataga ravine to enclose a freshwater lagoon. On account of the relative aridity, most dunes in the Canaries are sparsely vegetated and the unfixed dunes at Maspalomas advance east towards the lighthouse at a meter per year. Some of the dunes have succumbed to tourist development, such as at Playa de las Canteras in the north of Gran Canaria. In the easternmost part of the islands, the supply of beach sediment from the nearshore and the inland ravines is augmented from a more exotic source. Fuertoventura and Lanzarote are affected by the summer scirrocco, a hot wind from the Sahara 90 km to the east, which carries large quantities of dust and desert sand to the islands. Locally known as the kalima, it turns the day into twilight and regularly covers surfaces with a thin layer of sediment. Over the centuries, this sediment has been an important source of sand for the beaches of the easternmost islands. In the south, Fuertoventura narrows at the Pared isthmus where sandy beaches extend eastward to connect the original island of Jandia to the main island by what is now a low and narrow peninsula. On the eastern shore, the sands of the 26 km-long Playa de Sotavento (Sp: leeward) are protected from the dominant westerly waves. On the western side, the Playas of Cafete, Pared and Barlovento (Sp: windward) are more exposed with strong currents and undertows. Nearby Lanzarote is a similarly dramatic landscape of lava fields and steep cliffs with intervening sand beaches, such as the sweeping Puerto del Carmen beach on the east coast. Accretion is common at many of the valley-mouth inlets. Maderia comprises the main island itself, together with the smaller island of Porto Santo, the nearby Islas Desertas, together with the uninhabited Selvagens to the south. All of these islands are volcanic in origin but have not been active in the last 1.5 million years. As a result the, main volcanic core of Madeira, together with its plateau-like lateral subsidiary vents, has become eroded to produce deeply incised valleys and gorges running down to the sea. Between the mouths of the river valleys are high cliffs of vertical columns of basalt with layers of red and yellow tufa exposed in places. The 580 m plunging cliffs of Cabo Giroa, west of Funchal, are among Europe’s highest, but high cliffs are found everywhere on the coast of Madiera. In the north, fragments of shore-platform occur as well as small islets and skerries, particularly near Faial. There are several well-developed stacks near Ponta do Sao Lourenco in the northeast. Small beaches of rounded gray basalt gravel occur at several places, particularly where river mouths occur. The only sandy beach is at Prainha, on the extreme east of the island where the sand is mainly basalt. Shell sand occurs on the low plateau area in the extreme east of the island. The nearby island of Porto Santo is 14 km long and 5 km wide, its generally low volcanic profile veneered by thin deposits of sand, calcareous sandstone and clay. The cliffs of the north coast reach 100 m but the south coast is dominated by an 8 km long white sand beach fronted by a shallow sandy-floored bay backed by low cliffs of cemented sands. Protected from the main force of southwesterly storms by Madeira, from the west by the small island of Baixo and from the north by its own cliffs, the south coast of Porto Santo is relatively sheltered. It appears to have been subject to sediment accumulation over a substantial period of time derived both from a combination of shell sand from shallow nearshore surfaces, aeolian sand blown west on the scirrocco from the Sahara to the east and from topsoil erosion caused by early deforestation. The Selvagens are composed of limestone capped by lava and ash and are cliffed to 100 m in the north but with a gentler beach-fringed coast in the south. Emerged beaches and dune calcarenites occur on Pleistocene marine terraces at 3 and 7 m above sea level (Bird 1985b). The most northerly of the islands of Macronesia, the nine islands of the Azores are a widely separated group of mountainous but fertile islands which share the steep nature of many of the mid-oceanic islands but also have long beaches and many fishing harbors. The coast of the largest island, Sao Miguel, is a microcosm of the Azores coastline. Where the coast is backed by higher volcanic peaks, it is characterized by steep cliffs fronted by patchy low shore platforms, offshore stacks and islets, such as at Mosteiros. Emerged beaches and platforms occur at various heights up to 60 m (Bird 1985b). However, the highly indented coast also has short sandy beaches between cliff headlands. Where the hinterland is lower, longer sand beaches occur such as at Praia dos Moinhos and at Populo where small pine-clad sand dunes occur. Several coastal features of note occur on the other islands. Pico Island is 42 km long and dominated by a 2351 m cone-shaped strato-volcano of the same name. Various historical lava flows have extended the coastline and now have been eroded back to form low cliffs. In places sheltered from the dominant westerly waves, smaller volcanic forms survive on the coast, such as at Barca on the island of Graciosa where a volcanic cone has been sectioned by marine erosion to form bays fringed by crumbling cliffs of ash that cascade onto boulder beaches below. 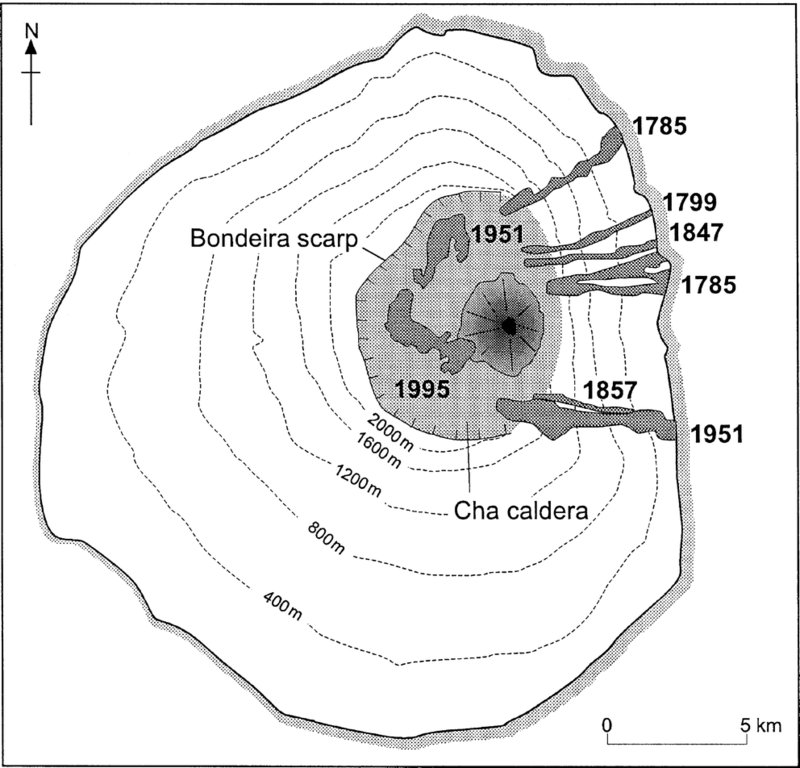 The 1957/58 eruption at Capelhino on Faial showered the adjacent coast in ash and contributed to accretion of the beach. At Porto Pim, also on Faial, a substantial sandy spit has developed (Bird 1985a). Such is the power of the surf reaching the Azores that Pico has been chosen as the site of a pilot plant to produce energy from waves. The rugged outer coast of the 16 main islands that comprise the Faeroes is the result of the deep incision of past glaciers into a thick pile of horizontally bedded flood basalts. These are slowly eroding, especially on the west and north coasts, due to constant exposure to high-energy westerly and northerly North Atlantic waves. The outer coast is dominated by high and sub-vertical cliffs that reach 820 m at Hestmuli in the north of the island of Kunoy. 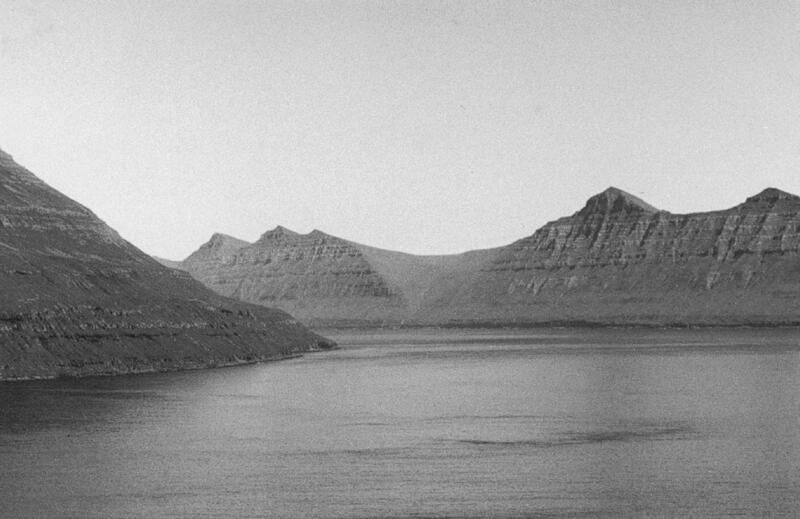 The rate of recession is unknown but is higher on the seaward facing slopes where cliffs have developed that tend to be steeper than immediately adjacent landward-facing glaciated slopes, such as at Tindholmur in the extreme west. The slopes of the inner coast are the sides of over-steepened glacial troughs that have been flooded by Holocene sea-level rise and are more subdued and better vegetated than the cliffs of the outer coast (Fig. 6). Small skerries, islets, and stacks (Fr: drangur) are common as are deep clefts and geos (Fr: gjogvs) where dykes and faults have been differentially eroded into the horizontal basalts of the west coast. Small, often structurally controlled, ramped shore platforms are common around most of the coast but tend to be more fragmented and smaller on the more exposed west and south coast. More continuous and better-developed platforms occur near the entrances to the fjords, particularly in the east. For example, well-developed shore platforms occur on the east coast of Vidoy. There are very few beaches in the Faeroes and the ones that do occur are almost exclusively found at the sheltered fjord heads. In such locations, wave approach is unidirectional and the limited amounts of sediment supplied by the small streams accumulates to produce small pocket beaches composed of black basalt sand (such as at Tjornuvik, Funningsfjordur, and Vidareidi) and occasionally backed by low sand dunes (such as at Sandur and Saksun). The coastline of Jan Mayen is dominated by the volcanic bulk of Beerenberg, a 2,277 m stratovolcano that comprises the northern half of the 54-km-long island (Norsk Polarinstitutt 1959). The coastline of Nord-Jan is steep and rugged, comprising 200–400-m-high cliffs eroded in ash, lava and tephra as well as into the ice walls of tidewater glaciers that spill down from the central crater. The coastline shows signs of recent advance as a result of lava tongues from eruptions in 1970 and 1985, which have extended into the ocean. These recent eruptions and flows are an extension of the mode of construction of the island over an estimated 700,000 years. Such additions to the coastline have resulted in the base of preexisting cliffs becoming buried by newer lavas and it is onto this platform that more recent glacier terminal moraines have been deposited, such as at Smithbreen in the northeast of the island (Kinsman and Sheard 1962). At Kroksletta, near the northern cape, 4,000-year-old moraines that rest on top of an emerged shore platform and beach at 8–10 m above sea level have been buried by subsequent lava flows. The protruding seaward edge of the Kroksletta lava is now cliffed to a height of 5–13 m (Kinsman and Sheard 1962). The south part of Jan Mayen is a hilly ridge of scoria craters and mounds and trachyte domes whose lower elevations and older age has produced a coastline of low gradient rocky platforms connected by gravelly beaches. In several places around the Sud-Jan coastline a prominent rock platform is present upon which is sited emerged beach gravels. This feature is particularly well developed on the north coast of Sud-Jan at Sorbukta, Engelsbukta, and Haugenstranda. Sediment supply to the central section coastline that joins Sud-Jan to Nord-Jan appears to be healthy both from erosion of the lava cliffs to the west and from shallow water sources: the 10 m depth contour lies about 0.7 km offshore. This has resulted in the construction of a substantial barrier beach enclosing a lagoon along an 11-km-long stretch of south-central coast at Lagunevollen, with a smaller barrier and lagoon at Stasjonsbukta on the north coast. The composition of these barrier beaches is not known but assumed to be composed of mixed sands and gravels transported from the west. Such a large beach complex is unusual for a small mid-oceanic island. However, the full impact of Atlantic westerly waves and swell at Sud-Jan is modified by a large circular submarine reef (probably an eroded volcanic cone), which reaches to within 11 m of the sea surface some 10 km south of Sud-Jan. Although the north coast is subject to variable amounts of sea ice for an average of four months, the south coast is mainly free of ice (Gloerson et al. 1992). Elsewhere, the coastline of Sud-Jan is steep and rocky but the cliffs are not as high as in Nord-Jan and small gravelly cliff-foot beaches fed by rockfall and wave erosion of the adjacent lava occur. With two notable exceptions, Bermuda and Sable, all of the Atlantic Ocean Islands have, or have had, a close and recent association with tectonic and volcanic activity. However, Bermuda, lying to the east of the Carolinas coast of the United States is a group of 150 limestone islands located about 1,000 km east of Cape Hatteras (Fig. 1). The islands rest on the southern margin of a 650 km2 platform that is presently submerged to depths of 20 m. However, boreholes at Bermuda have penetrated through a thin capping of calcarenites to meet lava at a variety of depths of 171, 43, 33, and 21–24 m (King 1972). The platform of volcanic rocks is the site for the northernmost coral reefs in the North Atlantic. 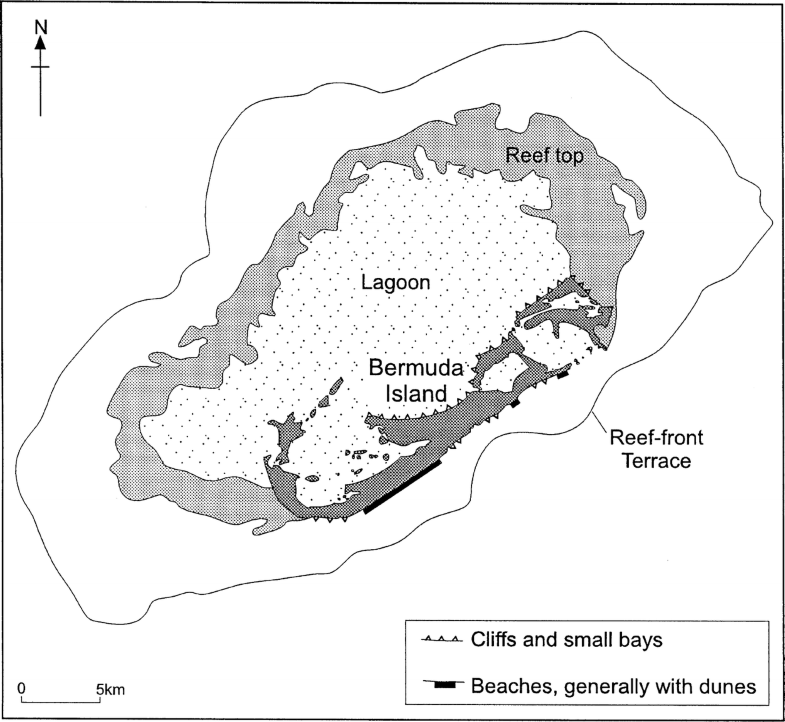 According to Vacher (1973) the present-day Bermuda platform consists of four geomorphological-ecological provinces: a reef-front terrace at 20 m depth; a main reef composed of 4 m deep coral-algal reefs everywhere except in the south where algal inter-growths occur; a 16 m deep lagoon in the north and the islands themselves forming a northeast trending chain near the southern edge of the platform (Fig. 7). The exposed limestones of the islands are Pleistocene calcarenite, 90% of which is aoelian and the rest is beach and shallow water in origin (Vacher 1973). The aeolianites were built from calcarenite produced mainly offshore and transported to the shore and so the inference is that during an earlier phase of submergence, the coastline was supplied by abundant reef-derived materials, which then led to beach and dune development before becoming lithified. This supply of reef-derived sediment to beaches and dunes continues today and progradation appears to be healthy (Bird 1985a), but patchy. Nevertheless the present supply also appears to be more restricted than the former supply, since only on the island’s south shore do extensive beaches backed by dune occur. These extensive sandy beaches are pink because of large numbers of fresh Homotrema clasts derived from the reefs 1 km from the shoreline (Mackenzie et al. 1965). However, much of the modern south coast is cliff with only limited sources of offshore-derived sediment. Unlike during the earlier development of the calcarenites, the sediments of the lagoon now appear to play little part in beach supply. As a result, the islands’ lagoon-facing shore is erosional with a line of cliffs and few pocket beaches (Vacher 1973). Sable Island (Fig. 1), on the continental shelf to the east of Nova Scotia, Canada, is a low and wind-swept series of sandy islands famous for its sandy shoals and shipwrecks. The development of the Sable Island Bank, on which the islands sit, is related to the proximity of the continental shelf-break and the maximum ice positions of the Late Wisconsin and later readvances. These ice movements deposited a thick suite of glacigenic tills and superficial sandy material, that was subsequently subject to transgression, modification, and transport (King 2001). The island has spectacular but desolate sandy beaches backed by sand dunes that reach up to 30 m high and cover 40% of the island’s surface (Byrne and McCann 1995). The intertidal zones of the long sandy beaches are characterized by prominent shoreface attached ridges with intervening depressions that reach up to 12 m deep (Dalrymple and Hoogendoorm 1997). Strong alongshore currents cause eastward migration of these bars alongshore at rates of up to 50 m a−1 and at angles of up to 50° to the coastal orientation (Dalrymple and Hoogendoorm 1997). The dunes of Sable consist of primary dunes that have developed in situ together with secondary dunes that have migrated across the island. The resultant coastal morphology represents a mix of both natural processes and anthropogenic disturbance. For example, the constantly changing coastal outline has resulted in the relocation of the lighthouse and is thought to be partly due to dune mobilization and reduced vegetation cover under the enhanced grazing pressure of introduced ponies (Owens and Bowen 1977). Sable Island has undergone 14.5 km of eastward migration but, in spite of this, its 30 km2 has been maintained over the past 200 years (Cameron 1965). Sable Island thus seems to be subject to a regime of deposition that appears roughly balanced by an equivalent amount of erosion.